My name is Paul Randall, Executive Director from Creditinfo Group, the parent company of Creditinfo Guyana, I was leaving Guyana when I read a copy of the Guybiz Inc. publication at the airport. Upon reading the particular Issue 29 I find that most of your main articles had significant resonance with my visit to Guyana. Given that the role of Creditinfo Guyana has such relevance with the challenges and issues raised in articles, I thought it was important that I took some time to inform you of the work of Creditinfo Guyana and how it is creating a transformative environment in Guyana for the financial sector, business activity and personal access to credit. Creditinfo Guyana is the first and only credit bureau in Guyana, receiving its licence in 2013, and starting operations in 2014. Creditinfo is operating credit bureau in over 24 markets globally, primarily in the Nordics (Iceland, Lithuania, Estonia, Latvia and Estonia) and developing credit countries in Caribbean (Jamaica, Barbados, Guyana), Central Asia (Georgia, Ukraine, Kazakhstan, Czechia, Kyrgyzstan), East Africa (Kenya, Tanzania) and West/North Africa (Morocco, 8 countries of WAMU). Globally we are unique in our ability to develop credit bureau from scratch, facing the challenges of educating the financial sector, adapting to legal environments and developing financial inclusion for individuals and SME. 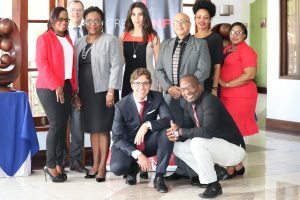 Recently the IMF mentioned in Guyana Inc. that they the welcomed changes to the credit reporting legislation, something that the Minister of Business also noted as a notable achievement in the article putting the Business industry under the Microscope. This change to legislation has indeed accelerated the development of credit reporting which was labouring as the financial sector took time to voluntarily change processes. As a result of the legislation, the database of credit agreements is well populated ensuring that lenders have a clear understanding of the existing loan agreements of any individual or business. The overall benefits of this are twofold, reduction of loan loss, and secondly providing individuals and business with a “personal credit collateral”. The universal database of credits enables lenders to reduce loan loss by avoiding providing loans to loan demanders that are already in difficulty repaying existing credits. Furthermore, it provides individuals and businesses security against them borrowing in a way that would lead them to a state of over indebtedness and deeper debt problems. This clarity in the lending environment means that the market has protection against systemic credit problems. This is certainly good news given the challenges stated by the Central Bank of Guyana of increasing non-performing loans during 2016. Banks are already seeing the improvement in portfolios’ through the use of credit bureau data. What is meant by “personal credit collateral”, this is evidence that the individual or business can demonstrate a long history of repayment, showing a responsible attitude to credit and their credit commitments. This historic performance is normally shown in the form of a credit score, this is true in Creditinfo Guyana where everyone or business with existing loans will have a credit score called the Creditinfo Predictor. This score is delivered in the form of a risk grade from A1 to E3 for ease of interpretation. A1 indicating a very high likelihood of repaying outstanding credits and E3 indicating a high likelihood of default. Creditinfo Guyana has recently invested in localizing this score which will be live in July 2018. At the recent Creditinfo Guyana event at the Herdmanston Lodge, the Honourable Dominic Gaskin, Minister of Business was keen to congratulate the stakeholders for reacting positively to the change in the legislation but underlined the importance that credit becomes lower priced for small businesses and efforts be made to expand financial inclusion. Better risk assessment will lead to lower cost and higher availability of credit for those with a good score, and the opposite for those that have failed to take their credit commitments responsibly. This status does not stay with people forever, so those that fall on hard times can re-build their “collateral” through improved payment patterns and they will see the score rating improve. At the event at the Herdmanston Lodge Creditinfo reiterated its commitment to support greater financial inclusion with the announcement of a highly innovative Utility Score for people and businesses that have not previously had credit in the formal sector, but rather, a history of repayment with Utility providers such as Guyana Power and Guyana Water. This initiative also can find its origins in the 2016 legislation changes to credit reporting when the submission of utility payments to the Creditinfo Guyana was made possible. The utilities have since been very active supporters in delivering data in a timely manner. Creditinfo showed that big data analytics that they performed on the vast amounts of data to show how you pay your utility bills is a very strong indicator of how you will pay your credit loans. This is wonderful news for financial inclusion, it means over 150,000 individuals and businesses will have a credit history and credit score even though they never had a credit from a financial institution. Terence Campbell, one of Guyana’s foremost entrepreneurs, recently said in an interview to Guyana Inc. magazine that the banking system needs to address the ability of small business to obtain loans. The availability of the Utility Score is a major step forward to improving the data needed for credit assessment. Adapting to new data sources will require change in processes and attitudes in banks and other lenders, however, Creditinfo Guyana is providing leadership in this transformation to digital lending and fintech, bringing their global experience to Guyana. Examples from across the world show that introduction of credit bureau and digital lending will fundamentally change the access to finance. In Georgia, a country of 4.5 million people in the Caucuses, a credit bureau was introduced by Creditinfo Group in 2006, positive data was added to the negative data in 2011. Still in 2014 about 30% of the adult population had received some form of formal credit, by 2018 that number had increased to 70%. This transformation is very typical. Between 4 to 7 years after the introduction of a private credit bureau the market will understand the benefits of a credit bureau and move to a digital lending approach relying on credit scorecard, and with a fall in operation costs, the feasibility of providing smaller short term loans to a wider population becomes feasible. The credit ecosystem is truly at a transformative moment. One of the most complete credit bureau legislations globally, Creditinfo Guyana an international credit company with a track record of leading countries through this process, a financial sector eager to improve and adopt international best practice, a Minister of Business attentive to providing the best environment for business growth, supportive utility and other “alternative data” providers, all will make this transition possible. Is this the end of the story, no, the work of Creditinfo Guyana is just beginning. Creditinfo Guyana will continue to add more and more datasets, system solutions for digital credit and risk management experts to support better credit granting and enhanced credit granting for economic growth. If you require further information do not hesitate to contact myself or Judy Semple who is CEO of Creditinfo Guyana and Georgetown based.